On Thursday 11th August, in Shanghai, over 100 top media from both China and overseas came together to experience 'Wetropolis', a showcase of the latest Counter Climate sneakers and apparel to come from Converse.Immersing visitors in a dynamic weather-filled environment, the event provided a showcase for new arrivals including the Chuck Taylor All Star II Shield Canvas and Chuck Taylor All Star II Rubber. Guests could also witness the new exclusive video piece shot together with Korean music star Oh Hyuk, who also appeared live at the event. Pure provided key support for the phenomenal unveiling of the latest NikeLab x Riccardo Tisci collaboration. High energy training in the morning was followed by a talk-of-town party in the evening featuring Breakbot! Produced in collaboration with Labelhood and Layuetsai. Pure has been in New York this week, bringing some of China's most influential media to be among the first to witness the outstanding new Converse Modern collection! JOYCE LING "FROM KITCHEN TO TABLE"
To celebrate the release of her Amazon No.1 selling cook book, Pure put together an intimate event for Joyce Ling including an exclusive food presentation and champagne reception. The event took place at Indigo Living, where Joyce has curated a special window display using her unqiue design touches and personal taste. Pure is the go-to agency for PR services for fabulous shoe brand Pedder Red. Stay tuned for more Pedder Red popping up in China's top media! For a five-day product exhibition for top Korean brand Rouge and Lounge at one of Shanghai's hottest shopping malls, Pure curated a sleek and refined product gallery featuring several of the most covetable bags on offer. On the first day of the installation, Korean megastar Jun Ji-Hyun stopped by for a private viewing and to pose for media photographs to the joy of hundreds of adoring fans! Tang, Bacardi's revolutionary new spirit distilled from Chinese green tea leaves, made it's pioneering debut at an exclusive dinner event crafted by Pure. In the first event globally for the state-of-the-art product, Pure created an ultra-premium, intimate space in which a select group of influencers and media could witness the drink for the first time.The tasting occurred alongside a specially-developed menu revolving around tea. During each course, stories were relayed about the product using immersive projection that enveloped the entire dining space, punctuated by performances that put an innovative spin on traditional Chinese elements. Converse's global Made by you campaign arrived in Shanghai in the form of a buzzing community-based 3-day event. Pulling together design installations from Shanghai-based influencers, junk food from GUMGUM and a bunch of interactive content, the event was a hotbed of Shanghai -fuelled individual expression. Made by Pure! An extensive three-month exhibition by prominent Israeli artist throughout the Yioulai Shopping Village Suzhou features a range of custom paintings translated into a range of different mediums. Curated by Davide Quadrio and produced by Pure. 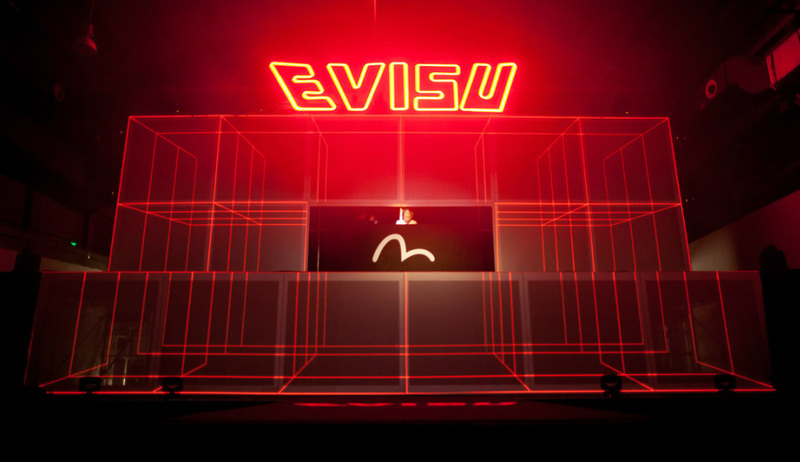 The unprecedented launch of the new Superstar video in Guangzhou meant an incredible futuristic space design by Pure, coupled with visits from Eason Chan and international DJ duo Stooki Sound. Ultramodern UV iPhone case printing provided a sleek cutting-edge interaction for attendees. Research shows that current employees of Swedish companies are extremely likely to recommend working for a Swedish employer with 91.6 per cent of respondents saying they would recommend it. Yet, in China, most young professionals are in the dark as to what is so unique and special about Swedish companies in particular. As part of a nationwide campaign lasting well into 2015, Pure is in the driving seat to execute an extensive range of services to promote Sweden's innovative business culture, including public relations, digital interactions and on-the-ground activities. To share a bit of seasonal love and celebrate with our many friends and clients, Pure teamed up with video production mavens Stink to put on an exclusive screening of their Sundance-winning film Lilting. Guilty cinema food, 5000 balloons blown in by industrial fans and a euphoric afterparty made for an electric workday night. Thanks go out to those wonderful people at GIG and Waterhouse for the awesome catering and venue. For Semir's biggest event of the summer - a date with Korean megastar Kim Soo Hyun - Pure put together a talk-of-the-town show under ultra-tight security. As the second time Pure has handled such an event in Zhengzhou with Semir, the event featured a high energy runway presentation showcasing the AW15 collections, followed by the celebrity appearance against the backdrop of hundreds of adoring fans. As the second of a string of revamped Adidas Originals 'neighbourhood' stores, Pure was on board to pull together the epic opening party catering for over 600 guests. Packing in a slew of custom art pieces by Shanghai-based artists, an awe-inspiring DJ/VJ centrepiece, four celebrities, loads of creative gifts and a selection of Shanghai-inspired bites. Very hot, very Shanghai, very Original! Marking the inaugural flight of the Air New Zealand Shanghai-Auckland Boeing 787-9 Dreamliner, Pure put together a celebratory dinner event to introduce VIP guests to the top-of-the-line new aircraft. Over Marlborough wine cocktails, guests could experience the distinctive 787-9 seating in front of a green screen photo station where they could choose from a range of iconic New Zealand landscapes as their backdrop. The dinner that followed featured a custom New Zealand themed menu and an exclusive performance from the crowd-pleasing Wellington International Ukelele Orchestra in a night full of prizes and guest interactions. Staying true to our nature as Shanghai's purest agency, we provided pro bono work for the first Project Reform outdoor creative exhibition! Jing'An Park was given a whole new lease of life with twenty sculptures, exhibits and installations created from recycled materials. Pure was the coordinating planner and spatial design lead for this charitable project. To celebrate Heineken's new limited edition "Cities" themed bottles, Pure repurposed an advertising shoot to become an awe-inspiring, interactive ride. On a custom-built one-seater vehicle, guests were transported through six different city experiences. The journey included automated installations, dozens of actors, theatrical effects and, naturally, a cold bottle of Heineken beer on hand at all times! Was great working with our partners in crime STINK again on this awesome project! Converting popular local cafes in Beijing and Shanghai, Pure crafted two branded spaces using props and product displays to feature a range of collections from Adidas Neo (BJ and SH) and Adidas Originals (BJ only). This media targeted event saw all of the major collections exhibited, with by one-on-one introductions from brand spokespersons and interactions throughout the afternoon. To celebrate Sephora's new last-all-day lipstick range, Pure put on a 12 hour long party with sessions catering to media, VIPs and customers. With custom neon-lit window displays, epic sized products and glittering glam photo backdrops, the store given a dazzling overhaul in pink, pink, pink! Among the wealth of interactions was a famous 'pink power' author talk, model make-up presentation and non-stop DJ. Pure was right there with Hong Kong born furnishings group Indigo Living when they began preparations to open their first flagship store in Mainland China. Founded on a robust communications strategy developed in consultation with the client, Pure has built up a pervasive on-going media presence and retail activations calendar. From printing to events, from retail activation to social media, Pure is the speed-dial agency of choice to cater for all of Indigo's needs. Following on from the coveted promotional book designed for the sprawling Hong Tang Chengdu commercial complex, Pure was called on this time to produce a version for their upcoming Suzhou project. Creating a sense of continuity with the brand while exploring unqiue essences that tie the project to the city of Suzhou, the latest design combines bold graphic styling and bilingual content to tell the project story in an engaging and unexpected way. The trademark 'East/West' structure of the retail complex is echoed in the book's distinctive split design. This was no traditional media day... To bring together media and VIPs to experience Sephora's range of fabulous products - many of them exclusive to the brand - Pure created an immersive journey lasting throughout the day. After each guest checked-in they would be transported into four distinct zones: Innovation, Nature, Sensation and Fun, themes that grouped together the different types of offerings. With each section having it's own dynamic look and feel as well as custom interactions throughout, each guest was left with a deep impression of both the products and the Sephora brand as a whole. It was Shanghai's turn to go Minho-mad as Pure organized a special event for the Korean mega-celebrity for the third time. An energetic party atmosphere filled the cavernous arena, fitted-out with neon beams, dynamic LED screens, concert-level lighting and a massive disco ball centerpiece. 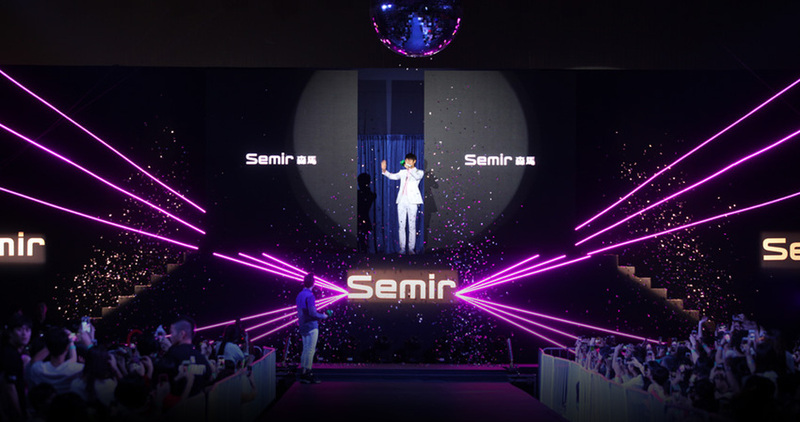 Amidst tight security, fans witnessed Semir's latest collections on the catwalk before the the stage opened up to reveal 'Oppa' to the screaming audience. Several on-stage interactions allowed fans the chance to meet their idol face to face before a climatic balloon drop ended the event on a celebratory note. With INSITE's and Fantasia's under-construction Hong Tang project in Chengdu taking shape, Pure was enlisted to create an overall brand concept for the space then package it together in a bespoke Brand Book. Aside from the creative concept and graphic design Pure was also in charge of the entire English and Chinese copywriting and the branding of the various floors and spaces within the retail area. For retainer client Safiya, Pure has spearheaded a rebranding campaign that is creating a revitalised strong presence for this ten-year-old shoe retailer in the China market. The journey began with conceptualising and mapping out the structure for building a strong platform for the brand, culminating in a fresh media approach including regular press days, a press trip to Barcelona and permanent show room at the Pure studio. Together with the Safiya brand team and key media, we are enhancing the Barcelona-inspired flair throughout all communications. Elisa Brunells) and time left over for some serious shopping! Media guests enjoyed a taste of Barcelona sunshine on Anfu Lu as Safiya made-over an existing store front to create a vibrant home-like atmosphere in which to premiere their Autumn/Winter collection. Guests interacted with lively photo and Spanish cuisine stations, while collaborating illustrator Lara Costafreda conducted a live watercolour painting that brought Safiya's latest collection to life. To unveil D:Fuse's summer collection and its latest collaboration with star designer Simon Gao, Pure put together an intimate event for media and VIP guests, making-over a downtown restaurant to bring attendees face to face with the exclusive line. Shoes were presented around the space, utilising the existing decor and fittings to present the products with a lifestyle flair. A branded styling experience for all guests provided a highly interactive element to go alongside the Scandinavian canapes and champagne. For Design Republic's show-stopping booth installation at Design Shanghai, Pure's production team were on the case to meet the high standards of quality within a tight schedule. Really great to be working with people at the top of their profession to produce amazing work! ​As part of the GMT London Pop-Up Store taking place at this year's Shanghai Fashion Week, Pure was enlisted to put together a special event for local hair stylist gurus J-Eleven. To kick-off the two day exhibition of 'Shanghai Gentlemen' hairstyles, Pure put together a cocktail reception and styling workshop for special guests and media invitees. Another year, another exhibition at the Bottega Veneta flagship store for which Pure has handled the exhibition and collateral production. The new solo exhibition by Birdhead (artist duo Song Tao and Ji Weiyu) is a photographic cross-examination of everyday life, covering a range of complex emotions as well as the friction between materialism and spirituality. Overhauling Dahood's store on Maoming Lu for one night, Pure put on a private invite-only event to spread the message that Stan's Back! The iconic tennis shoe took centre-stage within a sleek gallery setting, including a photo station that allowed guests to have their picture taken in the classic Stan green & white look. Individualised tote bags were press-printed on-site, together with a bevvy of custom stickers, which guests were able to then take away. Special guest Momo Wu, one of a few select global influencers sporting the shoe, took to the stage discuss her attachment to the shoes. A champagne-fuelled after party took the excitement late into the night. Since life-loving high street fashion brand Desigual's long-awaited arrival in China, Pure has been the driving force behind all media relations, social media activations and retail consultation, allowing more and more Chinese consumers to experience a taste of La Vida es Chula. As part of the massive Interior Living home design and products fair, Pure was brought in to ensure that the Homes-Up booth was the stand-out exhibitor. From initial concept to design to construction, Pure created an immersive space that fully embodied the real-living application of the product collections. Within the frame of a home-like structure, the layout separately evoked different moods and stories, bringing the products to life. At the very centre, a cafe area allowed visitors the chance to get to know the brand better while getting a taste of the parent company's European origins. Pure has been there since Tush's very inception, starting with their logo design and visual identity and developing their overall branding strategy leading. Joined at the hip along the way, Pure has handled everything from their packaging and store interior design to product naming and copywriting. Following the launch, Pure has orchestrated everything from regular talk-of-town events to the ongoing media relations, turning Tush into a head-turning new player in the undergarment sector. To unveil their fashion-forward underwear range to the world, Tush took over Bar Rouge's ladies night to put on a playful fashion show against the iconic backdrop of Shanghai's Bund. For the VIP preview special guests and media enjoyed customised cocktails and canapes by Mr. and Mrs. Bund as they watched the hot model presentation. Following this, the club let loose for a night awash in Tush's distinctive hot pink color! ​To create a party that unites music lovers and Originals fans and celebrates their originality, Pure turned the tables on the usual events format. By having all them enter ‘through the backstage’, guests could get a taste of where all of the party action really is. Click the above image to find out more about the event. Pure's relationship with Tush began at its very conception, designing their logo and entire visual identity. Since then, the partnership has flourished, with Pure going on to design their distinctive packaging, overall store interior design concept, customised product display counters, B2B marketing materials and product categorization and copywriting. All that London has to offer came to the forefront at a full-day conference in Shanghai, for which Pure handled all of the on-the-ground planning and execution. Charismatic Mayor of London Boris Johnson served as the key note speaker, forming part of his whirlwind China tour drumming up investment for the British capital city. Click the above image to find out more about the event. A Scandinavian Midsummer emerges in the heart of the SWATCH Art Peace Hotel... Click the above image to find out more about the event. Edgy jeans brand Evisu unleashed their super-charged Spring-Summer collection to a packed house in Shanghai, with Pure responsible for everything from the initial concept to the final electrifying execution. For more information, please click here. Unveiling Jeremy Scott's latest collection with a bang, Pure overhauled the new Adidas store in Lujiazui for a high-energy consumer event. Click the above image to find out more about the event. 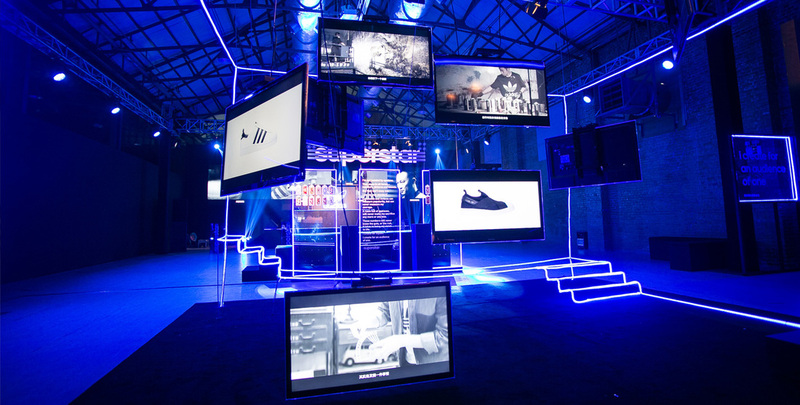 The fashion-forward and fashion-hungry came together for a tantalizing sneak-peek event put together by Pure for the extremely covetable Adidas Originals Blue collection. Click the above image to find out more about the event. Pure's quality-obsessed production team were recently back at Bottega Venetta's flagship store, helping out with their latest art exhibition. Click above to find out more about the work and for some behind-the-scenes pics. Under ultra-tight security, hordes of devoted fans crowded at the event venue to catch a glimpse of Korean superstar Lee Minho, while lucky invitees were able to witness an exclusive catwalk presentation as well as the premiere of Semir's latest fashion video. Click above to find out more.